There are several solutions for replacing missing teeth but often there are significant problems in choosing dental bridge, partial denture or full denture. Our Dental Implants Manhattan Center only uses best quality dental implants from Straumann (Basel, Switzerland). 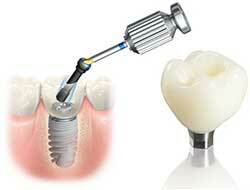 It’s the largest and most advanced dental implant company in the world. Internationally recognized, Board Certified Periodontist Dr. Navid Rahmani a top dental implant specialist in the country. 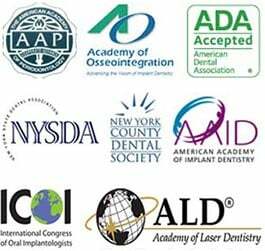 All dental implant procedures are performed in our Midtown Manhattan dental implants center. Dental bridges are still a popular option but they are not always the best solution for replacing one or more missing teeth in the same area of your mouth. If you opt for a bridge, your dentist will need to remove a substantial amount of structure from the teeth adjacent to the gap. This is because these teeth will have to be crowned in order to support the bridge. The crowns are attached to the replacement teeth to create a strong unit. This is not a good solution if these teeth are healthy and strong and are nicely shaped and don’t need to be crowned. Once that structure is removed it can only be replaced artificially. Even if you subsequently choose to have a dental implant, you will still need to protect these teeth with crowns. Additionally, crowning healthy teeth increases the risk of infection and decay developing underneath the crowns and it also places the teeth that have been crowned under additional stresses as they support the replacement teeth. Partial dentures are a cost-effective way to replace missing teeth but are far from perfect. They are kept in place with clasps that fit around existing teeth and which can be highly visible. Often teeth will need to be modified in order to fit these clasps and they can come under substantial pressure whenever you bite down on the partial denture. The resting of the partial and constant force that it exerts causes more loss. Patients who have been wearing a partial for many years also realize that their jaw bone shrunk in width and height. This becomes an issue when they would like to have a dental implant but have loss substantial volume of jaw bone. A full denture replacing all the natural teeth on your upper or lower arch is perhaps the most problematic solution of all. Often people with full dentures will struggle to keep them in place, especially after they have been worn for a few years and as bone loss occurs, making retention even more difficult. It can be awkward to eat and speak clearly with dentures and they do nothing to help oral health. They can easily trap food and plaque and often rub on the gums creating sore spots. The pressure placed on the gums and underlying bone causes the gums and the bone to shrink or reabsorb more quickly, making the problem with denture retention even worse. Eventually the bone resorption can be so substantial to cause a loss of dimension between the upper and lower jaw, causing a collapse of facial features that is prematurely ageing. When you choose to have dental implants you are helping to protect your dental health. Any existing natural teeth can remain whole and healthy as there is no need to adapt them in any way. They will not be placed under any additional stresses through having unsightly clasps fitted around them, but instead will benefit from dental implants that will help keep them in place, preventing them from drifting out of position and affecting your bite. One of the main reasons why you should consider having dental implants is their protective effect on your jawbone. Closely replicating natural tooth roots, dental implant posts help to preserve your jawbone, preventing resorption by providing essential stimulation to the bone, making sure your body knows it is necessary to continue renewing old bone cells. This prevents loss of height and dimension between your upper and lower jaw and helps ensure your remaining teeth are stable and strong. With dental implants, your replacement teeth will be held firmly in place. There is absolutely no danger that they could shift or move out of position, making it easier for you to eat. Being able to eat a greater range of foods can benefit your overall health as often soft, easy to chew foods may be nutritionally deficient. Being able to speak clearly and without fear of your teeth moving around can help you enjoy social occasions once more, something that is very important for general well-being. Your dental implants can never decay as this will is one of the most common causes of failure of crowns and bridges as the junction where the crown meets the tooth can begin to fail, allowing decay causing bacteria to get into the tooth. Above all, dental implants represent the most advanced way to replace missing teeth, offering a longer lasting solution that with proper dental care should last for many years.